The Arc Mid-South Executive Director Carlene Leaper featured in Grace Magazine! 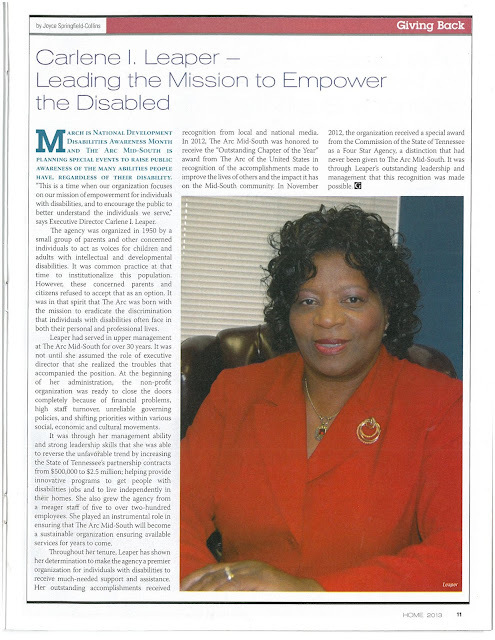 Check out this article about The Arc Mid-South Executive Director Carlene Leaper that appeared in Grace Magazine! What's Your Definition of Autism? What’s Your Definition of Autism? As you may know, a new edition of the Diagnostic Statistical Manual (DSM) is coming out in May with changes to the definitions of certain disorders on the autism spectrum which is used by medical professionals, government agencies and insurers. There has been much talk about what this will mean to individuals and their families when it comes to obtaining a diagnosis and receiving services. But during Autism Awareness Month in April, The Arc and Autism NOW would like to refocus the conversation on the individuals living with autism day to day and ask: “What’s Your Definition of Autism?” What does the word “autism” really mean to you on a personal and individual level? This April, we invite you to join us in raising awareness about what autism really means. If you are not already familiar with Autism NOW, The National Autism Resource & Information Center, visit www.autismnow.org for a wealth of high-quality, reliable information designed specifically individuals on the autism spectrum or with other developmental disabilities, their families and others who care about them. Autism NOW is a project of The Arc funded in part by the Administration on Intellectual and Developmental Disabilities. Please join the Mayor's Advisory Council for Citizens with Disabilities for its 2nd annual Disability Awareness Summit. The summit will be held April 19th from 10 a.m. - 2 p.m. at Benjamin L. Hooks Main Library on Poplar. To register, please visit www.brownpapertickets.com/event/326568. Hope to see you there!